When a team finishes their season standing amongst the six best teams in the country, they can face fairly lofty expectations the next year. Such is the case for this year’s baseball team that advanced to last year’s Division III College World Series after sweeping its way through the NCAA regional tournament and finishing the season as the sixth ranked team in the country. And so far, they have shown that they are up to the task to match or better that result from 2018. The baseball team seemed poised for great things after that magical run to cap off the 2018 season. Collegiate Baseball Newspaper had the Garnet tagged as the third-ranked team in the nation in their preseason rankings. While the loss of starting second baseman Matt Palmer ’18 and relief pitchers Jackson Ramey ’18 and Max Kassan ’18 to graduation loomed large, the Garnet looked well poised to replace them, especially with a large and talented incoming crop of freshmen. The Garnet brought in eleven first years in total, including six pitchers to help shore up the bullpen. When such a sizeable class of new players comes in, there’s always the question of how they will mesh with the team and how they will adjust to a new level of baseball. However, no such problems with team chemistry have seemed to emerge so far. “The freshmen are a great group of guys and they’re very talented and have learned very quickly. We can see that they want to win and we’ve already thrown them in a bunch of game situations and they’ve done very well so far,” senior pitcher Charles Groppe said. The Garnet also returned the services of all of their All-Centennial Conference selections from last season. Charlie Levitt ’19 was named to the All-Conference First Team after slashing .344/.452/.633 to go along with nine home runs and 41 RBIs. His season was perhaps even more notable for his nineteen hit by pitches — at one point in the season, he led Division III in this statistic. 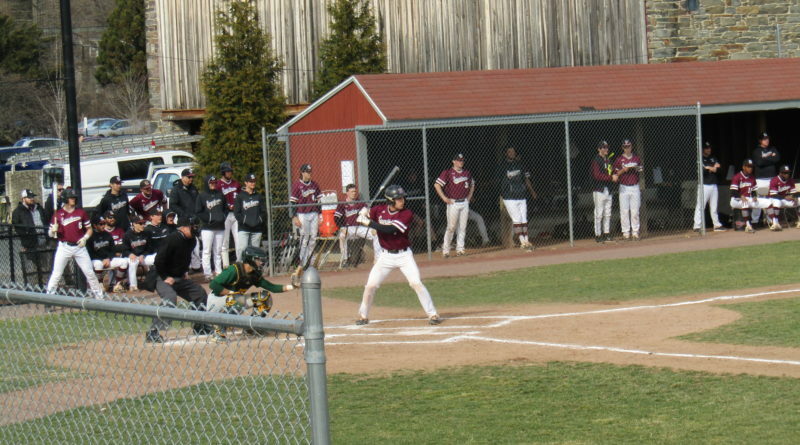 Jackson Roberts ’19 was the First Team’s designated hitter after mashing a single-season program record ten home runs while also batting an astounding .399. Sawyer Lake ’20 followed up a 2017 Rookie of the Year performance with a First Team appearance, recording an ERA of 3.42 while striking out 67. And Jack Corkery ’20, the Garnet’s relief ace, recorded eight saves and a WHIP of 1.13 to round out the Garnet’s representation on the First Team. Cole Beeker ’20 was a Second Team selection at first base after hitting .361 with seven home runs and 65 RBIs while also leading the team in swiped bags with twenty. Ricky Conti ’19 rounded out the list of All-Conference selections, although he was ultimately named a Third Team All-American for the season. The baseball team was scheduled to play six games prior to their spring break trip down to Port Charlotte, Florida. However, all were canceled due to snow and rain, leading to their very first game of the season being played in Florida after flying down the day before. In their first game of the season, Heidelberg, which had already played eight games, jumped on the Garnet early, putting up six runs in the first four innings and eventually taking down the Garnet 10-3. But the Garnet did not let their opening game loss get them down as they rebounded in big fashion in their second game of the day, taking down Scranton 27-8. They were led by six RBIs from Levitt, who also recorded his first home run of the season. 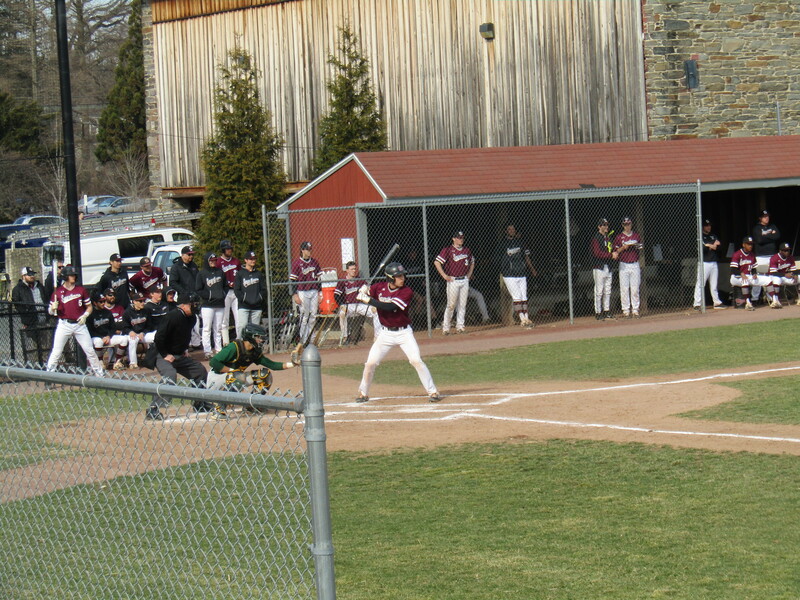 Paul Cooke ’22 also recorded his first home run with a two-run shot in the eighth inning. Perhaps the Garnet’s most impressive win of the trip came against the then first-ranked College of Wooster. The Garnet showed great tenacity in rallying from a 3-2 hole in the seventh and eighth innings. Holden Bridge ’20 got the rally going in the seventh with a leadoff double. This was followed by a Sam Jacobson ’21 single and then a Jared Gillen ’20 single to drive home Bridge and tie the game. Cole Beeker later drove in a couple runs with an RBI double and a few more runs would score later after an error by Wooster. The Garnet continued to pile on the runs in the eighth, securing a 13-6 signature win. Jack Corkery, throwing his second ever collegiate start, recorded a quality start with six innings of two-run ball. “It felt pretty good. We definitely had that game circled on our schedule, but now it’s over and we have to focus on beating every other team,” said senior pitcher Zach Gonzalez ’19. These comments by Gonzalez reflect a key part of the team’s mentality, which is to not get hung up on any individual game but to take each game seriously as they come and to quickly move on to the next opponent. Groppe had a similar take on the season. “Our goal coming into this season was to win a lot of games and have a lot of fun. But ultimately, we’re trying to win our conference again and make it back to the World Series, and that’s where our focus is,” he said. The Garnet are certainly well on the way to winning a lot of games. They walked out of the spring break with a 7-3 record, which they improved to 8-3 after a 6-1 win over Widener on Tuesday afternoon. In addition, they’ve managed to earn some significant individual accolades along the way. Holden Bridge, the team’s new starting right fielder was named Centennial Conference Player of the Week after hitting .565 during the Florida trip, hitting safely in all ten games the Garnet played. Sawyer Lake was named Pitcher of the Week after pitching a complete game two-hitter against Ohio Wesleyan, striking out ten. Coming out of spring break, Gillen, Beeker, Levitt, and Bridge were all hitting over .400 and the Garnet were scoring at an impressive clip of 12.4 runs per game which led all of Division III. The Garnet showed they could win in colder weather as well as pitcher Ryan Warm ’20 went the distance in the win over Widener and Conor Elliott ’19 hit a home run. Levitt just missed a solo shot to dead center earlier in the game that turned into a triple and led to the Garnet’s first run of the game in the 6-1 win. Overall the Garnet seem poised to continue their success from last season, combining impressive hitting with a stable of shutdown pitchers that have them ranked as one of the top ten teams in the country, and they have shown no signs of cooling down even in the colder Pennsylvania weather. The Garnet continue their homestand with a game against Drew University tomorrow at 3:30 p.m.